In Tanzanian classrooms, the average student to qualified teacher ratio is 49:1, with some classroom as large as 89:1 and the average pupil-textbook ration in primary schools is 5:1. The Classroom Champions Program serves two purposes at once. 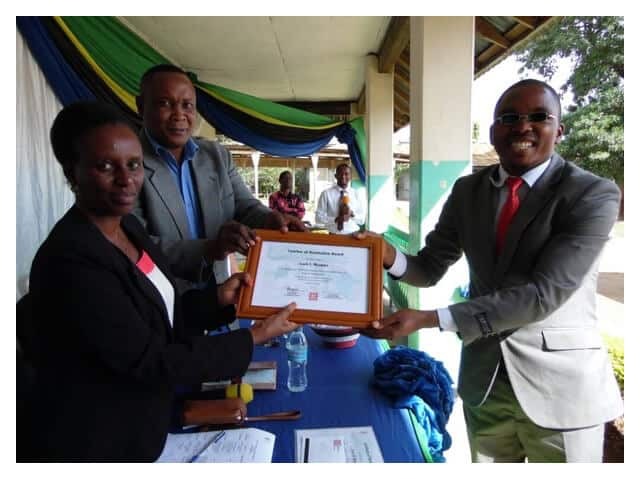 First, the funding for this program provides a targeted boost to Tanzanian classrooms, extending TFFT’s Teacher Training Program through additional support and instruction to teachers, as well as providing much needed classroom resources. With these additional supports, TFFT intends to create a ripple effect of change through the training of excellent educators. Second, becoming a Classroom Champion allows an individual, a family, a classroom or a group of friends to make a connection with a Tanzanian teacher and his or her classroom. This highly impactful program gives our donors, teachers, and their students a unique opportunity to connect personally with our programming in Tanzania. Donors will gain a first hand understanding of the school they are supporting and the impact their contribution has made in the classroom. This partnership also allows for pen pal relationships and tangible giving opportunities such as classroom wish-lists. So why do thriving teachers matter? Meet one of our 2018 Teachers of Distinction, Mr. Isack C. Msamba. Mr. Isack C. Msamba is a Chemistry teacher at a secondary school in Arusha City. Mr. Msamba is passionate about science. His creativity in teaching-learning methods and aids that create an engaging and rewarding learning experience made him stand out as a Teacher of Distinction. Isack uses real life examples in his lessons, incorporates experiments to enhance learning, and promotes different exercises to cater to the needs of all students in his classroom.